Every time I see pictures of Italy (anytime, but especially right now since I have a flight booked in May) all I can think is: TAKE ME THERE. Like, right now. Those of you who have been reading SBB for a while (and anyone who’s ever been around me during the soccer world cup LOL) will know that I’m proudly half Italian, and so the minute this dreamy romantic shoot at a villa looking over the city of Florence crossed my desk I was in LOVE. Can you imagine? 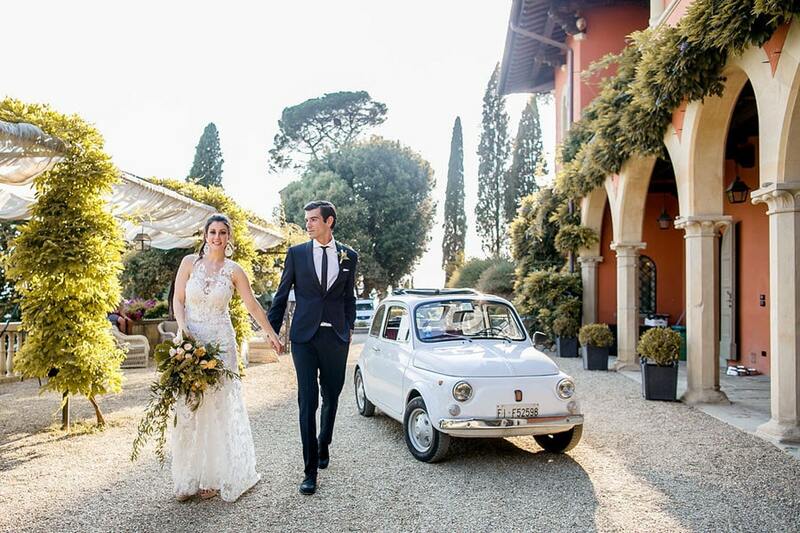 The Villa Le Fontanelle includes the villa, a fortress and a beautiful garden in the grounds, and it made an incredible backdrop for this shoot. 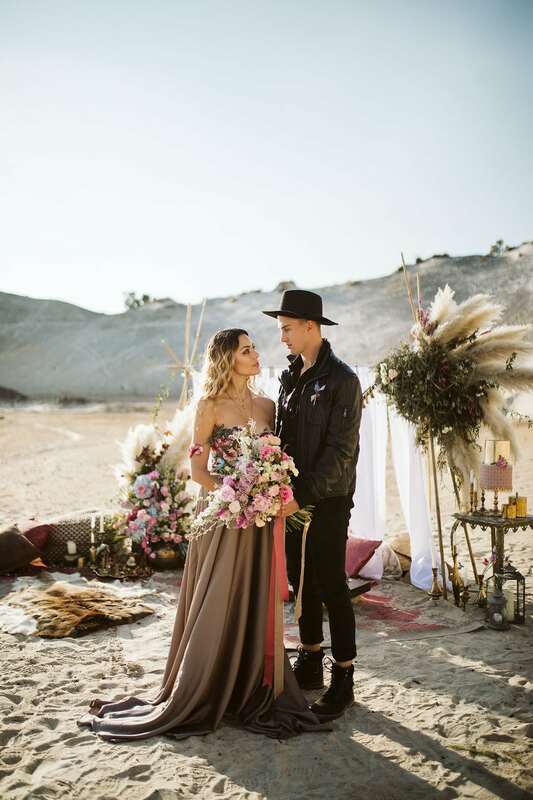 The talented team, led by planners The Tuscan Wedding, wanted to create a rustic, warm mood using neutral colors such as yellows, greens, browns, and reds. And it is warm, it’s inviting, it’s summery, and it’s oh-so-elegant. So let’s take ourselves there by diving into Storyett‘s dreamy pictures! I think one of the reasons that the travel wedding ‘theme’ has remained such a favourite with my readers year in and year out is that it’s one of the few that isn’t just about being a trend but is really about telling a couple’s story. For Greg and Tina, that story is bound inextricably with travel. Almost as long as they’ve been a couple, they’ve been travelling across oceans to be together, and exploring the world as they grown in love. It’s so romantic! And so when it came to finding a thread to run through their decor and design, it had to be travel. I absolutely love the ideas Tina executed to pull this off – the cake especially, but also the seating plan, the hand painted table names, the little aeroplanes here and there on the stationery. There were other clever ideas that told the couple’s story too though – a G&T bar to honour their monogram, a proudly South African menu to honour the place they met and fell in love, even a cocktail hour pub quiz for their guests (SO fun!). And all of this against the stunning winelands backdrop of Nooitgedacht Estate, which perfectly complemented the bride’s elegant vision. There are so many wonderful stories woven through this day, it’s definitely worth taking the time to read what Tina had to say about all of it, and sharing in these special moments thanks to the images by Art Photo! 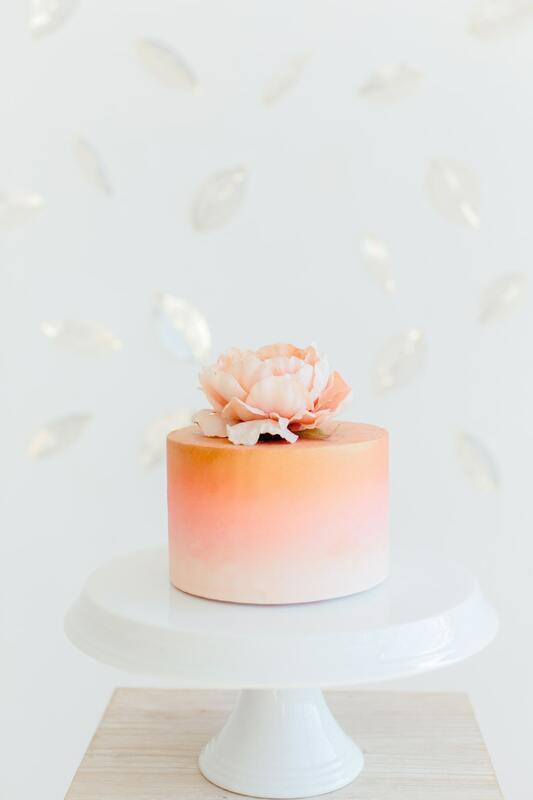 If there’s one thing that never fails to inspire me when it comes to weddings, it’s beautiful colours and unique combinations of hues. Which is why today’s shoot made my little heart sing when I received it from a talented US team headed by Kara Taylor Photography and Peachy Keen Coordination . It was inspired by – believe it or not – a suit. A suit in a gorgeous shade called Osprey Blue (isn’t that a wonderful name for a colour? ), which combines stunningly with a very soft peachy coral (love this as a soft wedding-friendly alternative to Pantone’s new Colour of the Year, Living Coral). The palette is perfectly complemented by series of soft, romantic details (hand lettered watercolour stationery, with transparent escorts as a modern touch), beautiful blooms, and light and airy images in a lofty neutral space. It’s just LOVELY. So let’s step in and enjoy it, shall we? 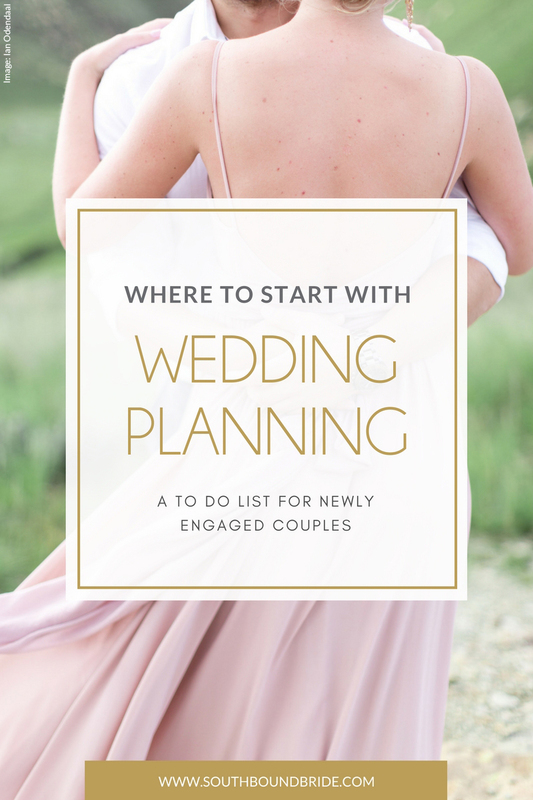 So you’re engaged, or thinking of getting engaged, and you can’t wait to get that engagement ring on your finger. But hang on, WHICH ring? Picking an engagement ring is a massive decision (whether you do it together or leave it up to your partner) – it’s a piece of jewellery you’ll have to wear and love for the rest of your life. The good news is that long gone are the days where pretty much everyone was after a platinum round-cut solitaire. These days, there are SO many incredible options, and you can pick whichever one suits your personal style (even if that IS a platinum round-cut solitaire!). With ethical diamond concerns, couples have opened their eyes to other gems or natural diamond substitutes, and traditional cuts have expanded to include many more of the so-called fancy shapes (for more on diamond shapes, see our guide!). And with celebrities having such a massive influence on design and fashion, there are always new styles and twists emerging alongside the classics. 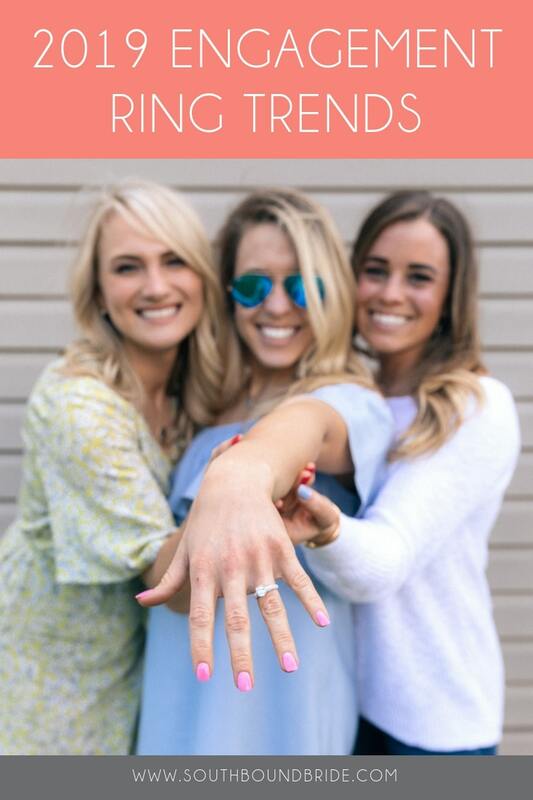 Here are the eight 2019 engagement ring trends that are taking the world by storm, and a selection of gorgeous engagement rings from Etsy to inspire you! Links in bold denote affiliate links. The cost to you remains the same, but SBB may receive a commission for any sales made. 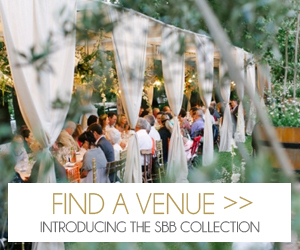 I don’t feature a lot of ‘celebrity’ weddings here on SBB – in general, I prefer to tell the stories of real people on the happiest day of their lives. But of course, celebrities are real people too, with their own real, beautiful love stories, and some of their weddings aren’t about the glitz and the glam and the feature on Top Billing, but rather the incredible joy of two people promising their lives to one another. So while you may recognise Cheslin Kolbe from his time at Western Province or as part of our Olympic medal-winning Sevens team, or most recently as a Springbok (yay! ), you’ll really fall in love with his wedding to beautiful wife, Layla. I’ve been holding on to this wedding for a while to share with you this week, and I’m so excited to finally let it make its SBB debut! It’s classic, it’s elegant, and most of all it’s heartfelt. 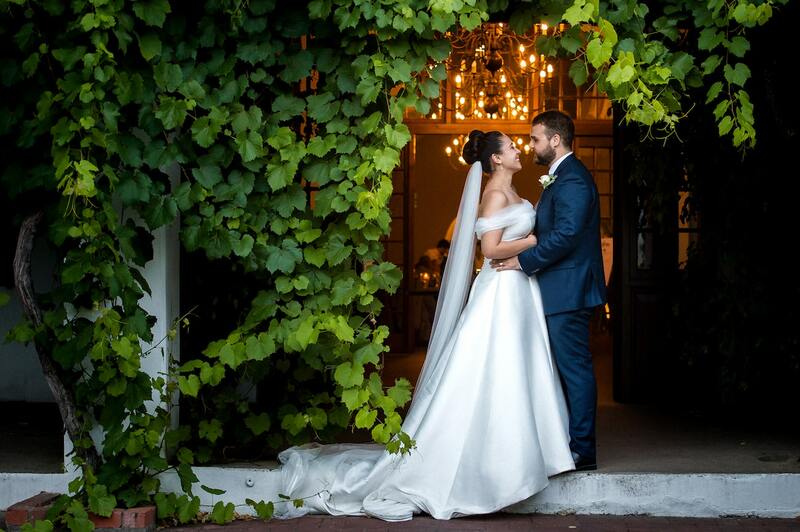 I defy anyone to watch the video and not get a little choked up when Cheslin does, as Layla walks down the aisle, or to grin along with them post ceremony – they both look happier than a man raising the William Webb Ellis. Also, I’m not gonna lie, there are some hot groom’s party images in here that you do not want to miss, since Cheslin was joined by (among others), our Springbok captain Siya Kolisi (along with his wife, Rachel, as a bridesmaid). What do you call a bunch of fit, shirtless rugby players in a swimming pool? A good day at work for Gaby, that’s what. Some of the other details we loved include Layla’s incredible Robyn Roberts gown, the timeless winelands setting, the fun cake topper, and of course, Layla and Cheslin’s sweet daughter as the most adorable flower girl ever! Huge congrats to the Kolbes, and to Lavender Creations for pulling off such a gorgeous event, perfectly captured by Duane Smith Photography. I’m a little biased because I adore her, but it seems to me that everything that’s in front of Eileen of Bright Girl‘s lens turns to gold. Or in this case, gold and sparkle, plus lots of bright, bold, beautiful colour! 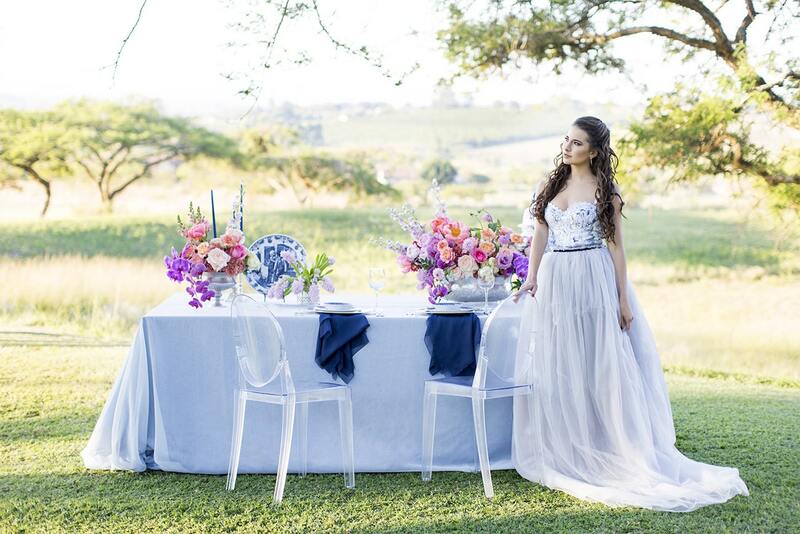 Lana and Greg’s wedding brought a whole punch of festive flair to the KZN winter – fat red peonies, roses in every shade of pink, velvet linens, a ceiling dripping in stars and twinkle lights, a shiny gold pear at every sitting. 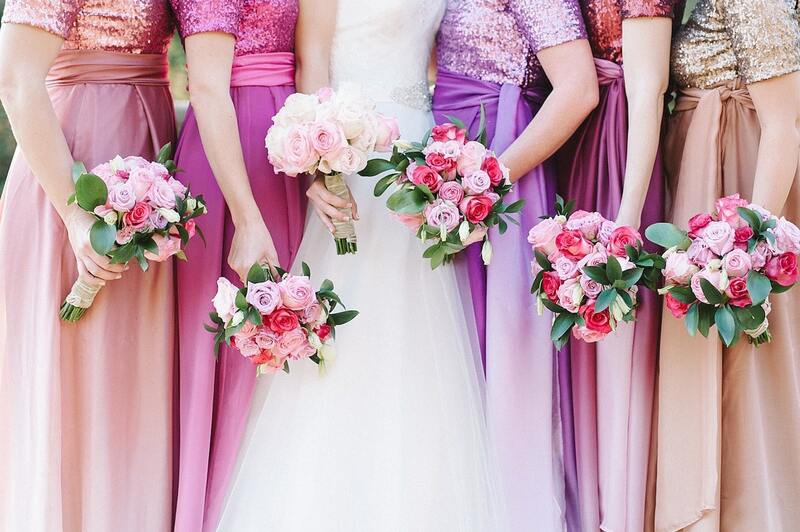 And the bridesmaid dresses – oh my! I’m obsessed with Lana’s choice of gowns, which manage to be romantic and a little ethereal, while also being colourful and super stylish – LOVE! 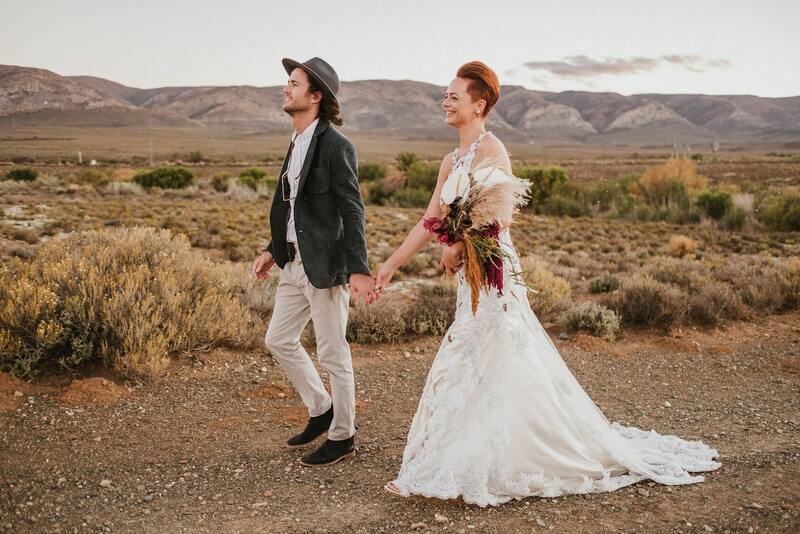 They worked perfectly with the abundant blooms and with Lana’s own dreamy pale blush wedding gown and perfectly matched the mix of whimsicality and grown-up glamour that characterised this very special celebration. All brought to life by Eileen’s lovely pics of course! Get those pinning fingers ready!